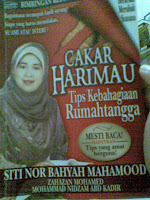 I found 1 book yesterday entitled Tips Kebahagiaan Rumahtangga authored by Ustzh. Siti Nor Bahyah Mahamood. Actually I bought this book when I volunteer as camerawomen in 1 of my mom programmed. Why?? This is because I want to get her signature. I’m not read this book yet but after 4 years, I find this book again and started to read it. 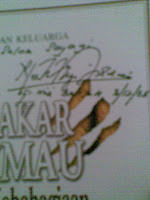 U can see the proof that she gives her signature in my book. If you can see the above picture clearly, the date also jotted down in there which is 3rd December 2005. Huhu… Thank God finally I read this book. After read it, I really love this book. The inputs really make me think is it I’m really ready to get married and a lot of tips to have a happy family. If you read the title maybe you think that this book is only suitable for someone who have get married but actually, this book also suitable for person like me and you who will someday will also get married. As a preparation before involve into another stage I guess. Insyaallah…. Let me tell you contains of this book to make you interested to read this book. 2. Mengapa Sukar Mewujudkan Perasaan Cinta? 4. Aku nak Kahwin, Kahwin dengan Siapa? Read it and I promise you’ll love it too….